Every Hang-A-Plan Plan Binder is hand assembled and tested to meet strict quality standards. If any components prove defective under normal use, they will be replaced free of charge. 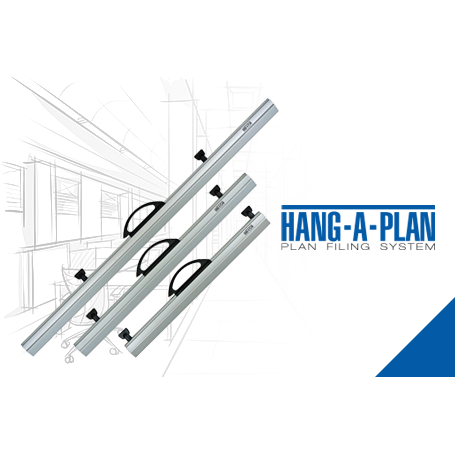 Hang-A-Plan offers two types of Planclamps; the GENERAL binders and the QUICKFILE binders. QUICKFILE Binders save valuable time by making it quicker and easier to add and remove sheets. The unique patented design features quick release levers, a high quality anti-jam spring-loaded clamp and clamp extension sheet guide. All Binders have a 10 Year Guarantee. Hang-A-Plan Binders keep sheets in original condition with no rolling, folding or adding strips or holes. Group up to 150 sheets together and secure within the binder clamp to keep them well organised, quick to access and easy transport. General Binders offer users a simple and strong economical Binder with a high quality 3-part aluminium clamp, easy open spring loaded anti-jam design, comfortable centred carry handle and wing nuts. The Binder will keep sheets in original condition with no rolling, folding or adding strips or holes. Group up to 150 sheets together and secure within the Binder clamp to keep them well organised, quick to access and easy transport.